Moving to Enfield Highway EN3 | Hire Our Moving Experts! Are you moving to Enfield Highway and want a little professional help? Are your removals to EN3 causing you stress or worry? Contact Moving Service today and we’ll provide you with the service you need for a smooth and stress-free relocation to your new property! Our award-winning removal options are ideal to help you with all of your moving concerns, from your packing to your transportation. Our friendly and talented specialists will work quickly and safely, with guaranteed results and your money back if you aren’t happy. If you want the best for that all-important day then you need to look no further. Pick up the phone and call us on 020 8746 4402 to find out more and to book! What Moving Services Do We Offer in Enfield Highway? Our extensive range of solutions makes us the perfect company for your move! We’re able to help you with a wide range of issues in EN3, from your packing and your lifting, to furniture moving, transportation, van hire and man and van rental. You’ll struggle to find better service than ours, and we’re always available when you need us with flexible and speedy assistance that even includes same-day help and bank holiday availability! Our movers know how to carry out a successful and safe EN3 move, so why turn to anyone else for your removal services? If you’re moving anywhere in the Enfield Highway area then get in touch with our team today to receive more information about the many ways in which we can assist you! Why Choose Our Eco-friendly Enfield Highway Moving Service? It’s important that we all do our bit to protect the environment. We are wholly committed to providing nothing but the greenest relocations possible, ensuring that everyone in Enfield Highway can move without any concerns about their impact on the planet. We employ greener removal methods and eco-friendly vehicles to help make your relocation a little healthier, and you will be pleasantly surprised with what we can do for you. If you want to work with a company that cares not only for its clients, but for the environment as well, then you’ve come to the right place. Get the help of a greener moving company by contacting us on 020 8746 4402 today! Enfield Highway is located in the London Borough of Enfield. 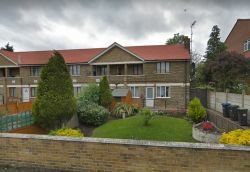 It falls within the EN3 postcode, and neighbouring areas include Enfield Wash and Ponders End. Enfield Highway is known for its many local amenities, including its library, the St James’ Church and its schools and colleges. Another famous sight in the district is Durants Park, a sizeable open space that dates back to the early 1900s. The most popular mode of public transport in the area is bus, with many routes servicing the district. The nearest railway stations are the Southbury and Brimsdown stations, making for fast and easy travel. For all of your moving needs simply contact Moving Service. We’ll send you professional and reliable movers and provide you with moving services for cheap and affordable prices. All of our rates are competitive and suitable for practically any budget, so if you want to save money then we’re the only removal company that you need to call. Moving to Enfield Highway, EN3 doesn’t need to be expensive or stressful – let out experts do the hard work so you won’t have to. Pick up the phone and book your appointment now! Call 020 8746 4402 for a free price quote or to book with us today for expert EN3 moving services at low prices!